Welcome to Visual Composer Page Intro. 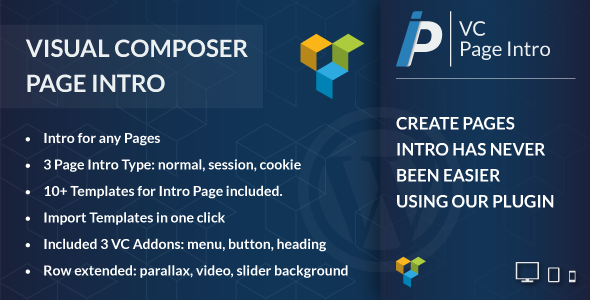 With this awesome plugin you can build one or more intro pages for wordpress using visual composer. 3 INTRO PAGE TYPES: Normal – Session – Cookie. You can choose your favorite intro page types. INTRO PAGE FOR ALL SITE: You can select intro page for all site. When a user enters into any page page intro will be displayed. INTRO PAGE ONLY FOR HOME PAGE: You can select intro page only for the home. When a user enters into homepage intro will be displayed.